Imagine a place where you can lose inches without having to exercise. Instead of doing crunches till your neck hurts, you can simply lie comfortably and - hey presto - that flabby tummy simply melts away. This magical place where you can lie comfortably and lose weight is The Body Firm. 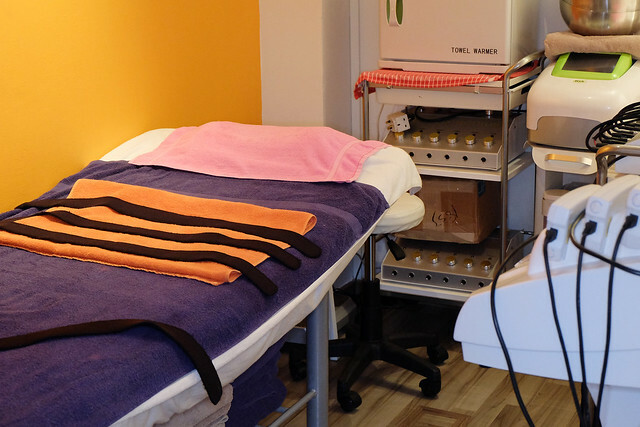 I went to The Body Firm located at Delfi Orchard on 17th February 2015 to try out their TBF toning treatment and Tripollar Radio Frequency treatment. What is this TBF toning treatment??? The Body Firm toning treatment uses a Hand Made Electronic Device created and manufactured by the co-inventor of the first pacemaker -- Gerry Pollock. The Body Firm toning machine is originally built at London University, and recently upgraded at the London Science Park in Innova, North London -- a European Community funded Research Center. This high intensity Inch Loss treatment provides the equivalent of over 330 sit-ups in a 25 minutes treatment reducing your hips or thighs or buttocks or stomach. I chose to do this treatment on my tummy. Muscles seldom work individually but in groups. The Body Firm toning system bypasses the signals normally coming from the brain that activate the muscles during exercise. This signal finds the nerves and provides an interrupted current that contracts the muscles and then relaxes them. The wave form unique to TBF toning system produces a slow "Ramp up", in other words, a smooth contraction of the muscle making it a comfortable muscle building experience. 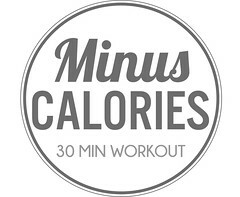 The result is "Passive Exercise" which in a 25 Minute treatment to the abdomen is the equivalent of 330 sit-ups. 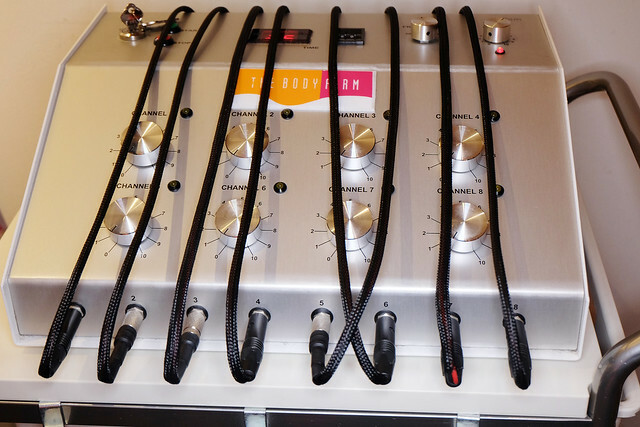 The system has eight channels and can treat different parts of the body simultaneously. If one goes for a 12 treatment course, a 5-15cm loss with 1-5kg weight loss could be expected. In addition, this treatment has a diuretic effect which results in the removal of toxins. I was ushered into a comfortable room and after a short consultation, we started the treatments. the abdomen is the equivalent to 330 sit-ups. And so this is how I did my 330 sit-ups in 25 minutes! the therapist told me that she would start the next treatment on my tummy. 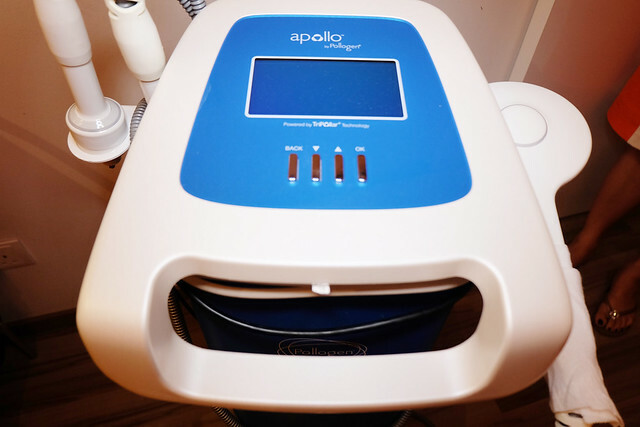 She brought the TriPollar Apollo machine into the treatment room. What is this TriPollar Radiofrequency treatment about??? 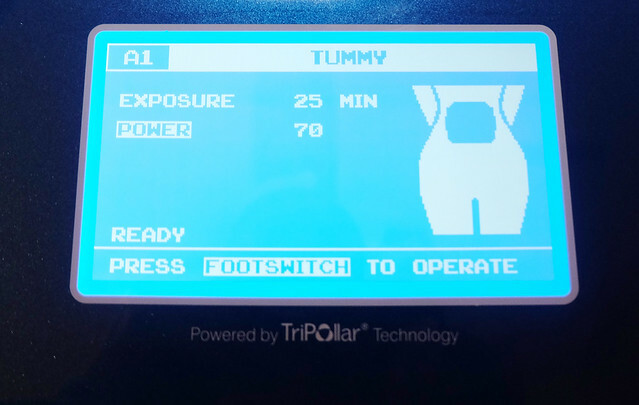 TriPollar is a 3rd generation radio-frequency (RF) technology for non-invasive facial and body contouring. It generates the RF current between 3 or more electrodes and focuses the energy to the treatment area only. 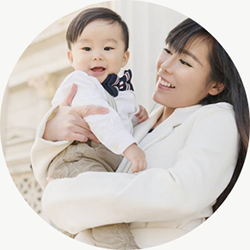 As a result, TriPollar RF delivers immediate and long-term skin tightening and rejuvenation, fat reduction and body contouring as well as cellulite reduction. This is a non-invasive treatment and the therapist would massage your affected area with the probe. This treatment felt like a warm massage to me and it was pleasant and pain-free. 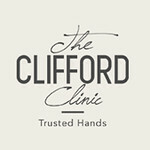 There is no down time after this treatment at all and one can resume regular activity immediately after the treatment. This treatment helps localize fat reduction, aids in circumference reduction, improves the appearance of cellulite and helps to lighten stretch marks. This treatment felt like a warm massage to me and it was pleasant and pain-free. I almost fell asleep during the treatment. and the therapist set the power to 70. I love my session at The Body Firm. I felt muscle aches the next day which meant that The Body Firm toning treatment worked. I also felt very comfortable as the therapist was very professional and polite. The treatment room was very clean. I felt that the skin on my tummy is slightly tigher. I highly recommend trying out the The Body Firm toning treatment especially if you do not like to exercise and TriPollar is worth trying out for tightening your sagging skin.